My apologies for the delay in blogging. My break before work has passed quickly; reality has caught up to me and I will be beginning work on Monday. I am glad, though, that I got a bit of traveling out of my system and will be updating about all that soon. 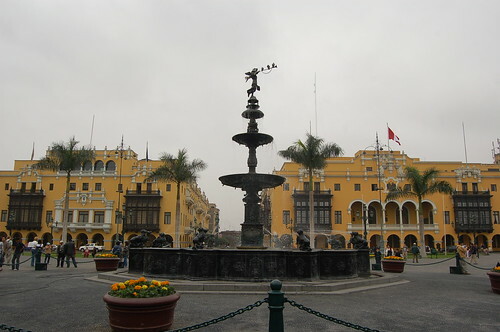 Plaza Mayor in Lima is the "old town" of Lima, a testament to the colonialism of the Spanish conquistadors. 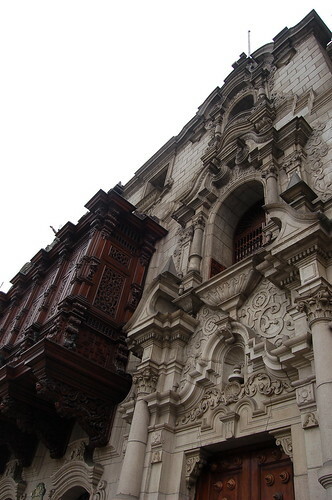 It is a square of impressive architecture, Baroque facades, interesting museums, and some great street food. 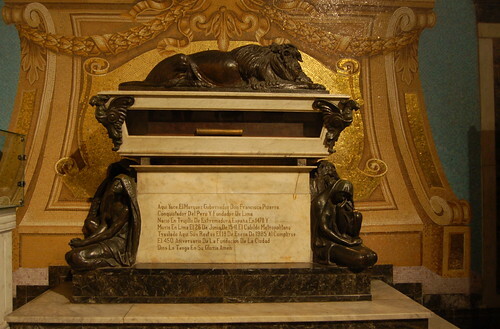 Among some attractions are Pizarro's tomb (he's quite small) and an extensive underground maze of catacombs. Good point. 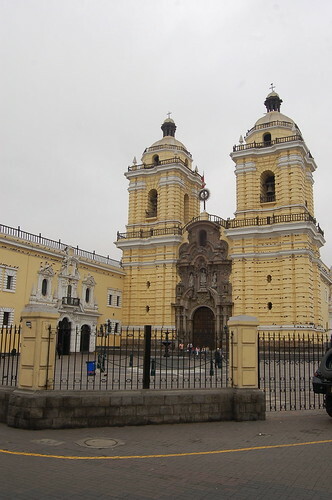 Interestingly enough, there is a large Chinese population in Lima: many came in the late nineteenth century to work on railroads. And so, there is a proliferation of so-called chifa restaurants all over the city; chifa is a fusion of Peruvian and Chinese influences, with more of an emphasis on seafood and spices. El Barrio Chino (chinatown) is just a few blocks east of Plaza Mayor, and is worth checking out, if not merely to compare yet another chinatown in a large city. Large pagoda-influenced entrance gate? Check. Stores of cheap plastic trinkets? Check. N and I had planned on lunching at a chifa, but along the way we got caught up in quite a bit of street food. Empanada and kebab stands line the streets, and for 1 sole (.33 cents) you can get a warm, toasty empanada or a fresh grilled meat kebab with a zesty spicy sauce. We did, finally, find a restaurant, and had a late dim sum lunch. This is quite a large restaurant with an unassuming entrance way. We walk past the roasted meats hanging in the window, and go upstairs to a very large banquet hall. We are seated and presented with Spanish/Chinese menus. It appears the only way to navigate this menu is through some phonetic educated guesses. We are not too hungry so we order enough for a mid-afternoon "snack." 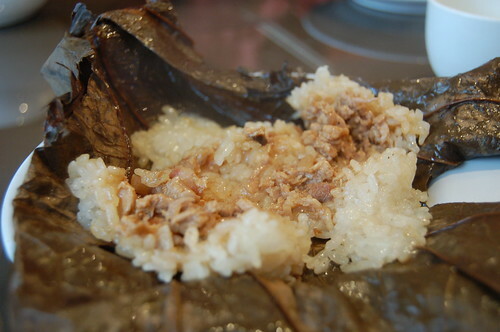 Glutinous rice wrapped in lotus leaf - good, but not great. It does not compare to the standards of Koi Palace et al in the Bay Area, but is a step above the average Chinatown joints in the city. 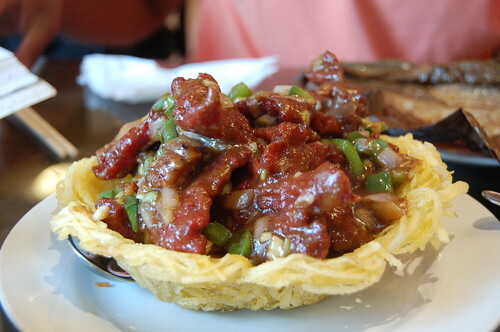 The epitome of the chifa dish, lomo saltado is stir-fried beef with strips of peppers, french fries, and onions. This rendition erred more on the Chinese side, and was therefore drenched in corn starch and sauce. This was perhaps the best of the three. 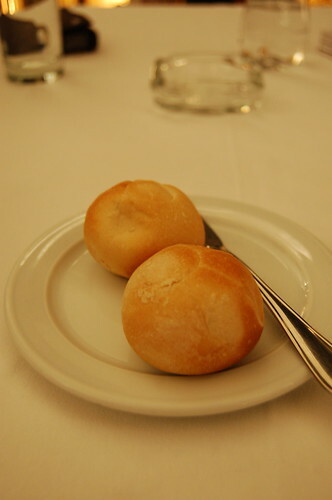 The buns were fluffy and soft, but the filling was fatty and the sauce too sweet. 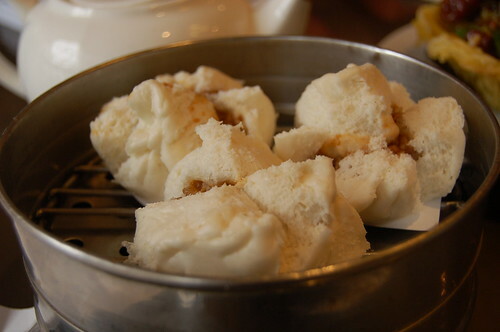 It fell just like the other two - roughly put together, over sauced, not much delicacy in creating the delicate art of dim sum. I guess mother knows best. 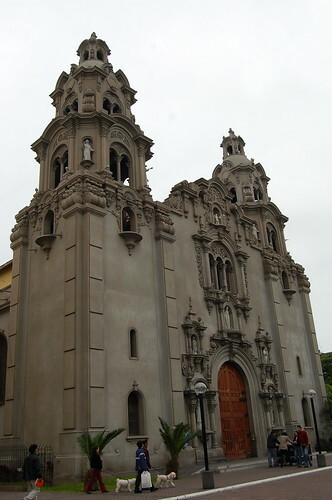 Barranco is called the Greenwich Village of Lima, and home to quite a few art galleries. The neighborhood overlooks the beach, and the streets are filled with local artisans' carts as well as intricate mansions converted into upscale, comprehensive artisan collectives. I fell in love with quite a few pieces, but decided I would not lug a 6'x5' canvas on a plane. 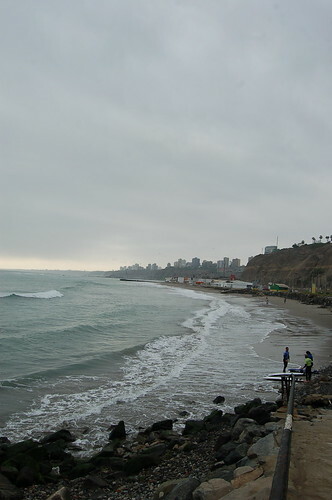 The upscale Miraflores is what locals perhaps consider the major focus of Lima's nightlife and trendy restaurant scene. The beautiful Miraflores Park, neatly lined with flower beds, is a hotbed of activity for young PDA couples, food vendors, shoe shiners, and artisans who set up shop in the PM. Visit the park on Sundays, and painters will line the sidewalk with their art, which is, in fact, very good. The streets surrounding the park are lined with stores and trendy cafes catering to the "moneyed" crowd: expats and tourists. It's a very commercialized area (yes, Starbucks is here), but it is quite a charming neighborhood. Outdoor seating is most commonplace, as is dog walking and people watching. Ok. Restaurant Huaca Pucllana is the most ridiculous restaurant I've ever been to, and one of the best dining experiences all around. 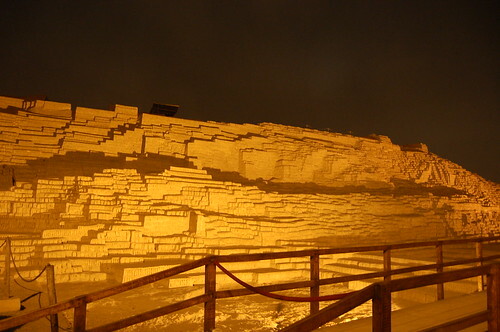 Huaca Pucllana is a pre-Inca adobe mound in the heart of a nice residential neighborhood in the northern part of Miraflores. 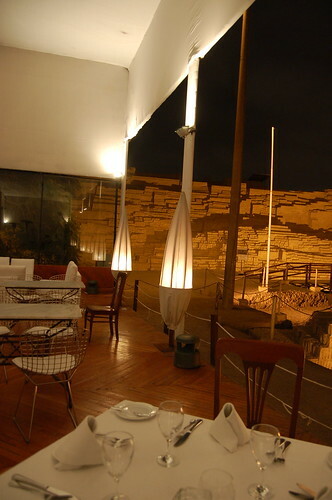 The restaurant is built right next to the ruins, with a open terrace that overlooks the main part of the pyramid. 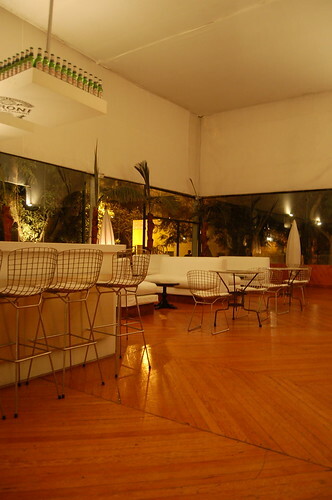 The restaurant itself is very Miami nightclub-esque, with all white minimalist furniture, right angles, and a chic clientele. It is absolutely breathtaking, and the biggest mystery is how anyone gave them the license to build on the site. UNESCO must be up in arms! We could not help but just feel awful for eating on such archaeological significance. 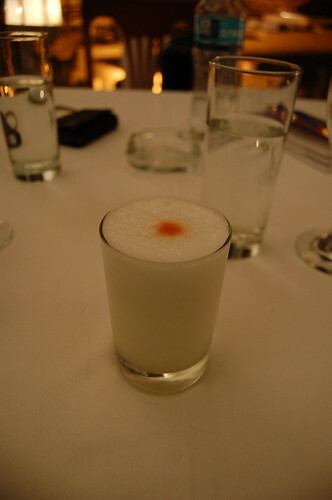 We started out Peru's signature cocktail: the Pisco Sour. Pisco itself is a white-grape brandy that tastes a lot like tequila; it is then mixed with lemon juice, syrup, and egg whites for the foam. The first sip is a huge kick in the mouth. Even with all the foam, you realize that this is one really stiff drink. It almost tastes like a really, really strong mojito sans mint. 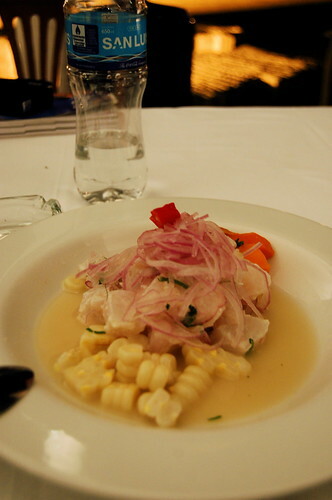 Ceviche is one of my favorite foods, and this one did not disappoint. 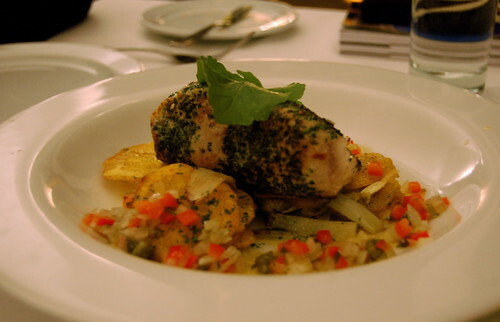 A deliciously fresh offering of marinated sole, accompanied by sweet potatoes and Peru's signature tumorous corn. Seriously, those kernels are huge. The marinade here was great, tangy and spicy. 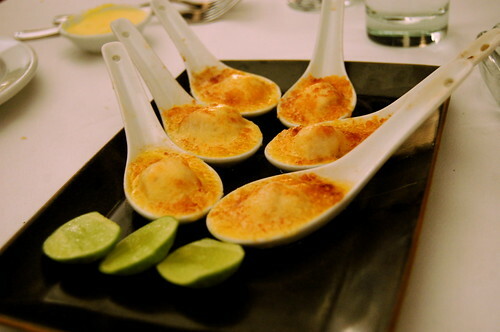 Another classic Peruvian dish, scallops come baked in Parmesan with a dollop of butter and lime juice. The scallops were fresh, but the Parmesan pretty much overwhelmed all other flavor in these bite-sized spoonfuls of cheese. Other than the ceviche, this was probably my favorite of the night. The chicken itself was delicious - flavorful with a great texture, indicative of some very good free-range meat. The saffron sauce was perfectly spiced with palatable Parmesan, cumin, turmeric, saffron, and onions. 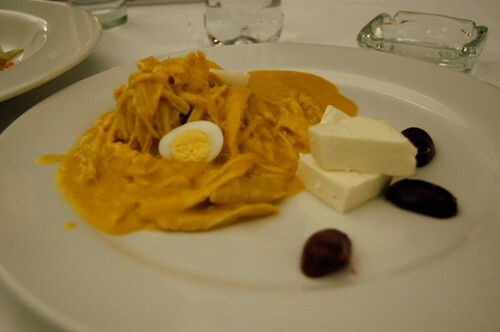 I did not enjoy the spongy strange cheese triangles on the side (I came to learn I did not enjoy any cheeses I tasted in Peru). By now, N and I were incredibly full from all the food. The pictures really don't show how large the portions are. The tuna was extremely fresh, seared a perfect medium rare, with its flesh still tender and succulent. My only complaint was that the crust was not very well flavored, but the fish itself was so fresh that it should have been the star anyway. A view of the 1500 year old pyramid from the terrace. A wonderful meal, made even better by the ridiculous setting. It definitely goes down as one of the best dining experiences of my life. If you ever make it to Lima, please go here. Just got back from an amazing time in Peru. Impressive ruins, great food, including a meal at my favorite cevicheria in the world.